In a severely resorbed maxilla Zygomatic Implants can be used to make use of the zygomatic bone. Similarly, Nazalus Implants enable use of the maxillary bone surrounding the nose. The implant site begins in the alveolar bone at the pre-molar and ends in the bone separating the maxillary sinus and nasal cavity. 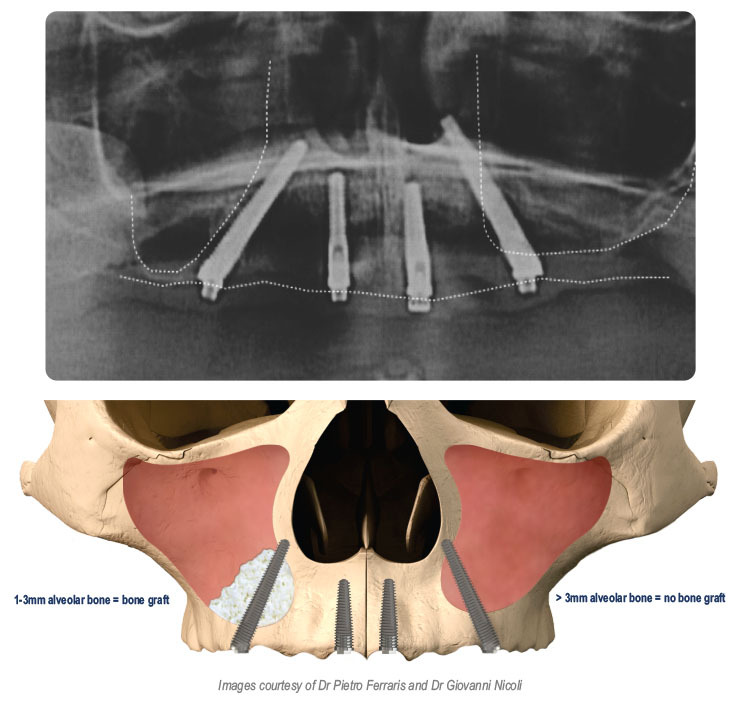 The specialized implants need to be extra-long to span across the sinus and they need to be angulated at 24°. 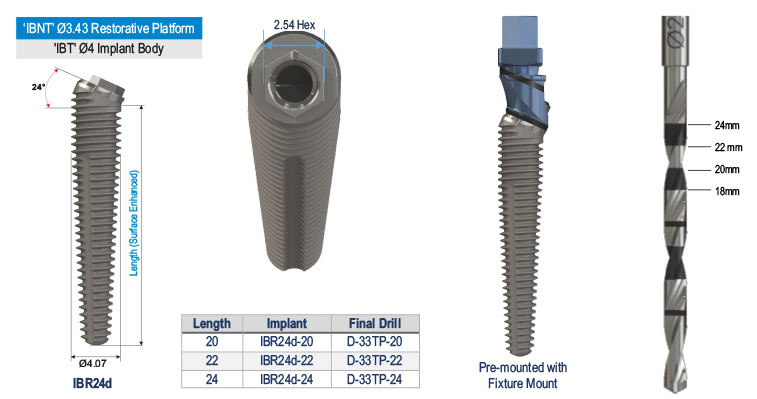 Therefore the prosthetic axis of the implant is designed at 24° to the implant body (the Co-Axis™ concept) and the implant is available up to a length of 24mm. Full product details and drilling protocol follow overleaf. Placement position is shown in the figures below. It is important to note that bone grafting is recommended when the alveolar bone thickness is less than 3mm. Initiate the site preparation with a round burr or equivalent drill. If the alveolar has more than 3mm of good bone, use the Ø2x24mm pilot drill to drill through the alveolar, into and across the sinus, engaging the lateral nasal wall. The 24mm depth gauge can be used to palpate the hole depth for implant selection. Drill to final depth with the D-33TP final drill using low speed (350rpm). Place the implant in accordance with standard Co-Axis® implant placement procedures, ensuring the prosthetic axis of the implant is aligned correctly. NB: If the alveolar bone is less than 3mm thick or of poor quality then bone grafting must be applied. Open a window in the lateral sinus wall. Gently reflect the Schneiderian membrane and insert bone graft into the sinus.